NOTE: Some resources linked below are the property of the clients for whom the resources were created, and are not meant for free public distribution. Please e-mail me at dr.tobin@att.net to obtain the password to get access to them. Reach Everyone, Teach Everyone: Universal Design for Learning in Higher Education. With Kirsten Behling. Morgantown, WV: West Virginia University Press, 2018. 11 Jan 2019: Gagné, Ann. "Reach Everyone, Teach Everyone" [PNG]. 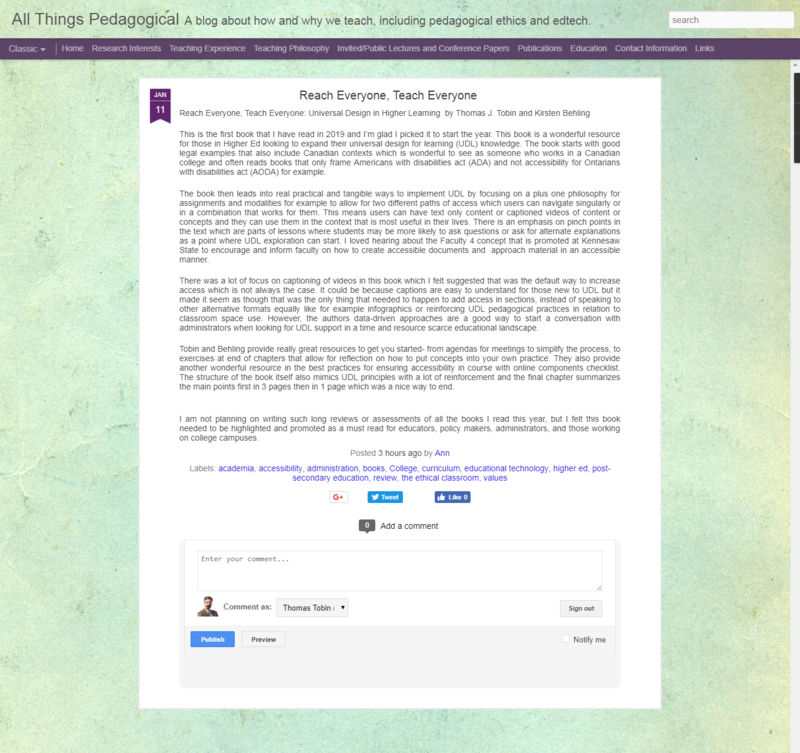 All Things Pedagogical blog. https://allthingspedagogical.blogspot.com/2019/01/reach-everyone-teach-everyone.html. 6 Dec 2018: Linton, Greg. 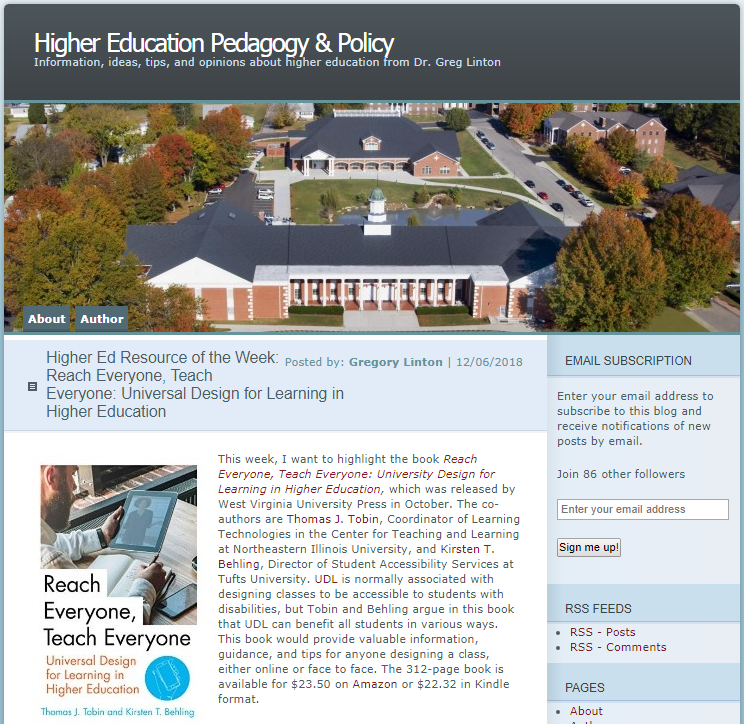 "Higher Ed Resource of the Week: Reach Everyone, Teach Everyone: Universal Design for Learning in Higher Education [PNG]." Higher Education Pedagogy & Policy blog. https://glinton.wordpress.com/2018/12/06/higher-ed-resource-of-the-week-reach-everyone-teach-everyone-universal-design-for-learning-in-higher-education/. 28 Nov 2018: Johnson, Mindy. "UDL in 15 Minutes: An Interview with Loui Lord Nelson [PNG]." National Center on Universal Design for Learning. https://medium.com/udl-center/udl-in-15-minutes-an-interview-with-loui-lord-nelson-1af12f2cf47a. 28 Nov 2018: Lieberman, Mark. "Q&A: Making Sense of Universal Design for Learning [PNG]." Inside Higher Ed. 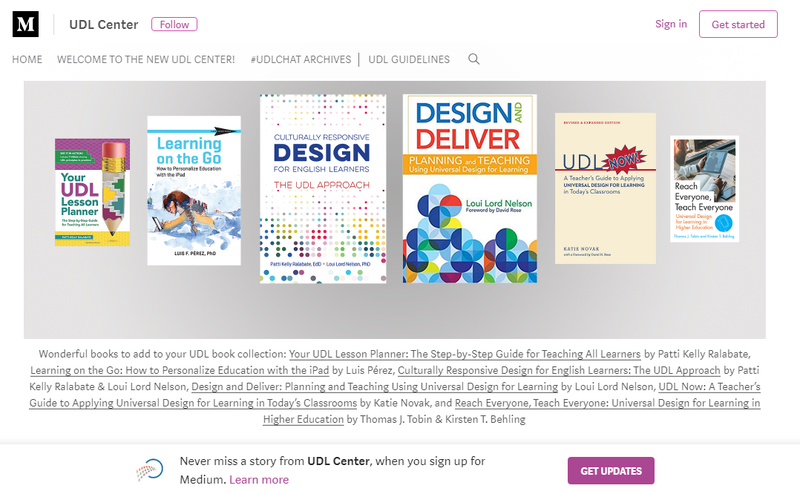 https://www.insidehighered.com/digital-learning/article/2018/11/28/new-book-offers-guide-evolution-universal-design-learning-udl. 25 Nov 2018: Hammond, Ruth. "Selected New Books on Higher Education [PDF]." Chronicle of Higher Education. https://www.chronicle.com/article/Selected-New-Books-on-Higher/245153. 16 Nov 2018: Petersen, Naomi. "New book on how to engage ALL learners in higher education." Accessibility Studies blog. Central Washington University. https://www.cwu.edu/accessibility-studies/new-book-how-engage-all-learners-higher-education, [PNG version]. 18 Oct 2018: Stachowiak, Bonni. "Reach Everyone, Teach Everyone." Teaching in Higher Ed podcast. Episode 227. https://teachinginhighered.com/227. 28 Aug 2018:"Back-to-School Reading." Invited Panelist. 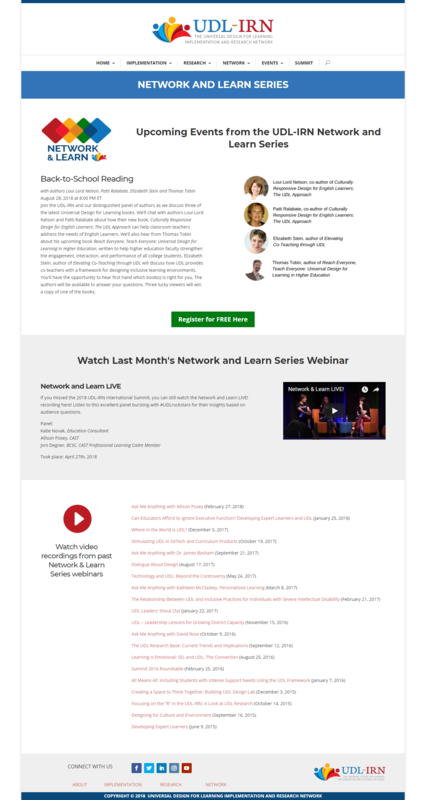 Network & Learn webinar series. Universal Design for Learning Implementation and Research Network (UDL-IRN). Highlights Video [15:07]. The Copyright Ninja: Rise of the Ninja. Comic book. State College, PA: St. Aubin Comics, 2017. Evaluating Online Teaching: Implementing Best Practices. With B. Jean Mandernach and Ann H. Taylor. San Francisco: Jossey-Bass, 2015. https://www.wiley.com/en-us/Evaluating+Online+Teaching:+Implementing+Best+Practices-p-9781118910368. 26 May 2015: "Thomas Tobin collaborates on Book about evaluating online faculty." News and Announcements, Northeastern Illinois University. 3 Jun. 2015: "New at NEIU" [PDF]. Northeastern Illinois University Alumni Newsletter . 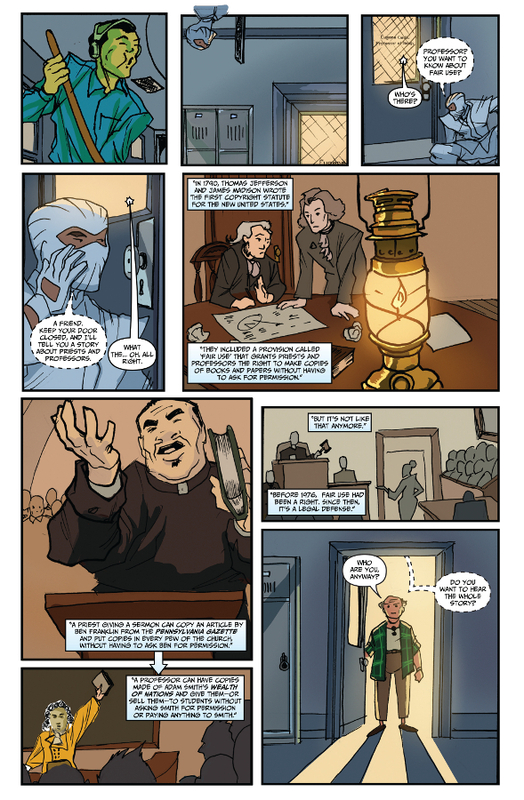 17 Jun 2015: Nelson, Cooper. "Mandernach adds book to lengthy list of accomplishments." GCU Today. Grand Canyon University News Bureau. 22 Jul 2015: Walsh, Paul. What the plagiarism detection software isn't detecting." Academic Innovation blog. University of Baltimore. 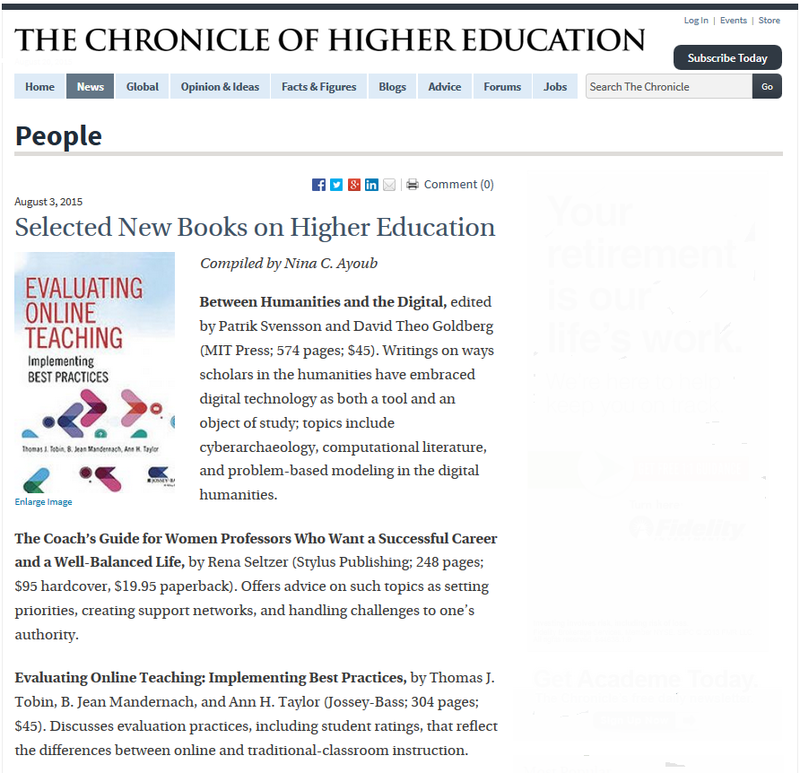 3 Aug 2015: Ayoub, Nina C. "Selected New Books on Higher Education." Book notice [PNG image]. The Chronicle of Higher Education. 19 Aug 2015: [Rader, Gary]. "How to Increase Student Evaluation Response Rates." Missouri State Online Faculty Support Services. 24 Aug 2015: Jenkins, Adam Wayne. "A Roadmap for Evaluating Online Teaching: A review of Evaluating Online Teaching: Implementing Best Practices." eLearn Magazine. 3 Sep 2015: Center for Disability Information & Referral. Notice. CeDIR blog. Library at the Indiana Institute on Disability and Community, Indiana University-Bloomington. 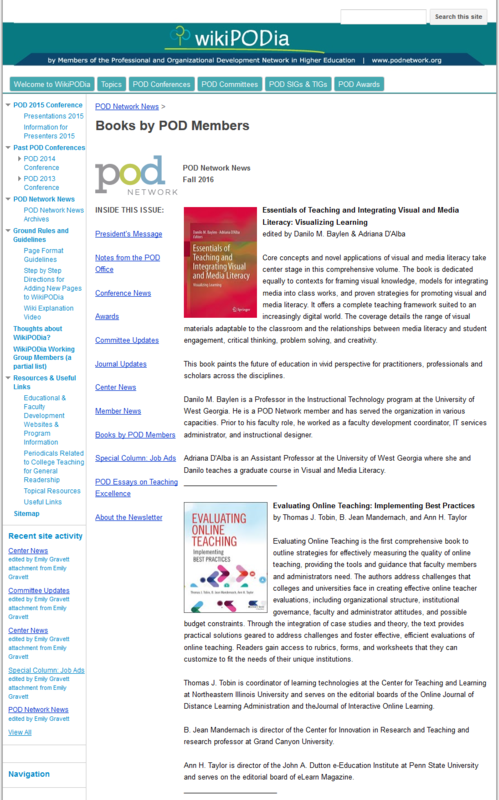 16 Sep 2015: "Popular Instructional Technology Books." Top Book Rankings [PNG image]. Good Reads. "The eLearning Leader's Toolkit for Evaluating Online Teaching" [PDF]. Leading and Managing e-Learning: What the e-Learning Leader Needs to Know. Eds. Piña, A. A.; Walker, V. L.; and Harris, B. R. Cham, Switzerland: Springer International Publishing AG, 2017: 235-252. "Improve the Flipped Classroom with Universal Design for Learning." With B. Honeycutt. Handbook of Research on Innovative Pedagogies and Technologies for Online Learning in Higher Education. Advances in Higher Education and Professional Development (AHEPD) series. Hershey, PA: IGI Global: 449-471. "How Universal Design for Learning Supports the Flipped Classroom" [PDF]. Flipping the College Classroom: Practical Advice from Faculty. Ed. Barbi Honeycutt. Madison, WI: Magna Publications, 2016: 66-72. "How Universal Design for Learning Supports Concept Mastery in the Flipped Classroom" [PDF]. Flipping the College Classroom: Practical Advice from Faculty. Ed. Barbi Honeycutt. Madison, WI: Magna Publications, 2016: 86-90. "How Can Course Design Help Prevent Online Cheating?" [PDF] Teaching Strategies for the Online College Classroom: A Collection of Articles for Faculty. Ed. Deidre Price. Madison, WI: Magna Publications, 2016: 95-101. 1 Feb 2019 release. How Can I Ensure Academic Honesty in My Online Assessments? 20-minute Mentor series. Madison, WI: Magna Publications. 15 Jul - 31 Dec 2018. Content designer. "Diversity, Equity, and Inclusion" micro-learning module. Louisville, CO: EDUCAUSE Learning Initiative (ELI). 15 Mar - 30 Jun 2018. Content designer. Micro-Learning Module series: Presentation Best Practices. Presenter Concierge web site. Louisville, CO: EDUCAUSE Learning Initiative (ELI). 9 Nov 2017 release. Copyright Crash Course: How Can I Stay on the Right Side of the Law? 20-Minute Mentor series. Madison, WI: Magna Publications. 14 Sep 2016 release. How Can I Implement Universal Design for Learning (UDL) in 20 Minutes? 20-Minute Mentor series. Madison, WI: Magna Publications. 14 Sep 2016 release. How Can I Implement Universal Design for Learning (UDL) in 20 Days? 20-Minute Mentor series. Madison, WI: Magna Publications. 14 Sep 2016 release. How Can I Implement Universal Design for Learning (UDL) in 20 Months? 20-Minute Mentor series. Madison, WI: Magna Publications. 9 Mar 2016 release. How Can I Evaluate Online Teaching if I Haven't Taught Online? 20-Minute Mentor series. Madison, WI: Magna Publications. 6 Mar 2016 release. How Can Course Design Help Prevent Online Cheating? 20-Minute Mentor series. Madison, WI: Magna Publications. 3 Mar 2016 release. How Can I Design Academic Integrity into My Online Programs? 20-minute Mentor series. Madison, WI: Magna Publications. 19 Jan 2016 release. "How to Evaluate Online Teaching." Just-In-Time Learning professional-development materials. Madison, WI: Magna Publications. "Don't Tell the Faculty: Administrators' Secrets to Evaluating Online Teaching" [Best Paper Award]. Online Journal of Distance Learning Administration 18.3 (Fall 2015). http://www.westga.edu/~distance/ojdla/fall183/tobin183.html. "Increase Online Student Retention with Universal Design for Learning" [PDF]. Quarterly Review of Distance Education 15.3 (Fall 2014): 13-24. "Training Your Faculty about Copyright When the Lawyer Isn't Looking" [Best Paper Award]. Online Journal of Distance Learning Administration 17.2 (Summer 2014). http://www.westga.edu/~distance/ojdla/summer172/tobin172.html. "Best Practices for Administrative Evaluation of Online Faculty." Online Journal of Distance Learning Administration 7.2 (Summer 2004). http://www.westga.edu/~distance/ojdla/summer72/tobin72.html. "Best Practices for Online Information-Literacy Courses [Rich Text]." Journal of Interactive Online Learning 2.4 (Spring 2004). http://www.ncolr.org/issues/jiol/v2/n4/best-practices-for-online-information-literacy-courses. "Issues in Preparing Visually Disabled Instructors to Teach Online: A Case Study [Rich Text]." Information Technology and Disabilities 8.1 (Jan 2002). http://easi.cc/itd/volume8/number1/tobin.html. "Dealing with Problem Students and Faculty [Rich Text]." Online Journal of Distance Learning Administration 4.3 (Fall 2001). http://www.westga.edu/~distance/ojdla/fall43/tobin43.html. "Making the UDL Case to Campus & School Leaders." 2019 UDL-IRN International Summit Proceedings. Ed. Alisa Lowrey. https://www.learningdesigned.org/resource/making-udl-case-campus-school-leaders. "Universal Design for Learning: Three Aces up our IT Sleeves." Invited article. EDUCAUSE Review. 4 Feb. 2019. https://er.educause.edu/blogs/2019/2/universal-design-for-learning-three-aces-up-our-it-sleeves. "The Online Administrator's Semi-Painless Guide to Institution-Wide Academic Integrity." Distance Learning Administration Annual 18 (2017): 207-212. "The Case of the Unevaluated Online Courses." Academic Leader Today blog. Madison, WI: Magna Publications. 5 Jun. 2017. "Get More Traction for Your Awesome Universal Design for Learning Program, Part II." Invited article. Next Gen Learning blog. EDUCAUSE Learning Initiative. 4 Jan. 2017. "Get More Traction for Your Awesome Universal Design for Learning Program, Part I." Invited article. Next Gen Learning blog. EDUCAUSE Learning Initiative. 29 Dec. 2016. "One Change That Increases Student Persistence, Retention, and Satisfaction." Academic Leader 32.10 (Oct. 2016): 7-9. Brar, Harman. "Universal Design for Learning is a Philosophy--Not a Practice." Interview article. D2L Blog. 8 Jul. 2016. http://www.d2l.com/blog/universal-design-learning-philosophy/. "Two Radical Shifts in How and Why Higher-Education Distance Learning Administrators Should Promote Universal Design for Learning." Distance Learning Administration Annual 17 (2016): 201-212. "The Case of the Unevaluated Online Courses." Academic Leader 31.10 (Oct. 2015): 1, 3. "Evaluating Online Teachers for Veteran Administrators." With Jennifer Patterson Lorenzetti. Distance Education Report 19.14 (15 Jul. 2015): 1-2, 7. "Don't Tell the Faculty: Administrators' Secrets to Evaluating Online Teaching" [Best Paper Award]. Distance Learning Administration Annual 16 (2015): 143-154. "The 104 Best Practices for D2L Technology--Deeper Dive #6: Easter Eggs." Brightspace Community Teaching and Learning Blog. 11 Feb. 2015. https://community.brightspace.com/s/article/The-104-Best-Practices-for-D2L-Technology-Deeper-Dive-6-Easter-Eggs. "The 104 Best Practices for D2L Technology--Deeper Dive #5: Scavenger Hunt." Brightspace Community Teaching and Learning Blog. 11 Feb. 2015. https://community.brightspace.com/s/article/The-104-Best-Practices-for-D2L-Technology-Deeper-Dive-5-Scavenger-Hunt. "The 104 Best Practices for D2L Technology--Deeper Dive #4: Cartoon Me." Brightspace Community Teaching and Learning Blog. 20 Jan. 2015. https://community.brightspace.com/s/article/The-104-Best-Practices-for-D2L-Technology-Deeper-Dive-4-Cartoon-Me. "The 104 Best Practices for D2L Technology--Deeper Dive #3: Break It in Pieces." Brightspace Community Teaching and Learning Blog. 22 Dec. 2014. https://community.brightspace.com/s/article/The-104-Best-Practices-for-D2L-Technology-Deeper-Dive-3-Break-it-in-Pieces. "The 104 Best Practices for D2L Technology--Deeper Dive #2: 10-Second Videos." Brightspace Community Teaching and Learning Blog. 2 Dec. 2014. https://community.brightspace.com/s/article/The-104-Best-Practices-for-D2L-Technology-Deeper-Dive-2-10-Second-Videos. "The 104 Best Practices for D2L Technology--Deeper Dive #1: Checklists." Brightspace Community Teaching and Learning Blog. 6 Nov. 2014. https://community.brightspace.com/s/article/The-104-Best-Practices-for-D2L-Technology-Deeper-Dive-1-Checklists. "Academic Integrity: Defining Originality across Campus." Faculty Focus 20 Oct. 2014. http://www.facultyfocus.com/articles/teaching-and-learning/academic-integrity-defining-originality-across-campus. "Training Your Faculty about Copyright When the Lawyer Isn't Looking" [Best Paper Award]. Distance Learning Administration Annual 15 (2014): 174-190. "Universal Design in Online Courses: Beyond Disabilities [PDF]." Online Classroom 13.12 (1 Dec. 2013): 1-3. http://www.magnapubs.com/newsletter/online-classroom/story/6783/. "Best Practices for Evaluation of Online Courses" [Best Paper Award] [Rich Text]. Distance Learning Administration Annual 5 (2004). "Preparing Visually Disabled Instructors to Teach Online" [Rich Text]. Distance Learning Administration Annual 3 (2002): 135-144. "From Zero to Sixty in Six Months: Developing a Fast-Track Online Program." Distance Educator eZine 15 May 2001. http://www.distance-educator.com/de_ezine/article.php?sid=121. "Problem Students and Faculty in Online Courses" [Best Paper Award]. Distance Learning Administration Annual 2 (2001): 53-70. "Developing Online Courses in the Two-Year Institution." Learning Technology Newsletter 2.1 (Jan. 2000). http://lttf.ieee.org/issues/january2000/index.html#tobin. "What Are Metacognitive Skills and How Can They Be Used in the Classroom? [Rich Text]." Kappa Delta Pi New Teacher Advocate (Fall 1998): 6. "Teaching Metacognition." The Experiential Learner 2 (Fall 1996/Spring 1997): 18-19. Lieberman, Mark. "Helping Institutions Reach Accessibility Goals." "INside Digital Learning" section. Inside Higher Ed. 20 Feb 2019. Kim, Joshua. "A Q&A with Alt-Ac Thomas J. Tobin: Navigating Alternative-Academic Scholarship, Employment, and Life." Invited interview. "Technology and Learning" section. Inside Higher Ed. 14 Feb 2019. D'Angelo, Tony. "Interview with Thomas Tobin & Kirsten Behling: Reach Everyone, Teach Everyone." Episode 210. The Collegiate Empowerment Show podcast series. Host Tony D'Angelo. Easton, PA: Collegiate Empowerment, Inc. 16 Jan. 2019. Nave, Lillian. "Making UDL Work for Everyone with Thomas J. Tobin." Episode 3. ThinkUDL podcast series. Host Lillian Nave. CollegeSTAR consortium. Boone, NC: Appalachian State University. 15 Jan. 2019. Linder, Kathryn E. "Professional Websites as Conversation Starters" [PDF]. Resource profile. Maganing Your Professional Identity Online. Sterling, VA: Stylus Publishing, 2018: 83. Stachowiak, Bonni. "Reach Everyone, Teach Everyone." Teaching in Higher Ed podcast. Episode 227. 18 Oct. 2018. https://teachinginhighered.com/227. Bajka, Györgyi. "Teaching Teachers How to Teach: An Interview with Thomas Tobin, Faculty Developer" [also published in Hungarian and Dutch]. EPALE Magazine blog. Electronic Platform for Adult Learning in Europe (EPALE). 21 Sep 2018. Tissot, Leonardo. "Universal Design for Learning Is about Access." E-Learn Magazine. 20 May 2018. https://elearnmagazine.com/universal-design-learning-access/. West Virginia University Press. Author Gallery: Meet the Experts in Our Series Teaching and Learning in Higher Education." Booktimist blog. 14 Feb. 2018. Samuel, Anita. "Innovation. Inspiration. Connection. A Review of the Distance Teaching and Learning Conference 2017." eLearn Magazine. Oct. 2017. http://elearnmag.acm.org/featured.cfm?aid=3152718. McMurtrie, Beth. "Controversy at George Washington U. Highlights Challenges of Diving Deeply Into Online Education" [PDF]. Chronicle of Higher Education. 23 Oct. 2017. http://www.chronicle.com/article/Controversy-at-George/241528. MEMBERSHIPS · PHILOSOPHY · REFERENCES · RÉSUMÉ · FULL C.V.
Last update 18 April 2019. © 2001-2019 Thomas J. Tobin. Site content shared under a Creative Commons BY-NC-SA license.